If you are looking forward to improving your barbecuing experience by buying a new grill, then Traeger is a name you can always rely on. The Grills Forever team has thoroughly reviewed Traeger grills and smokers, and we have found this to be true. 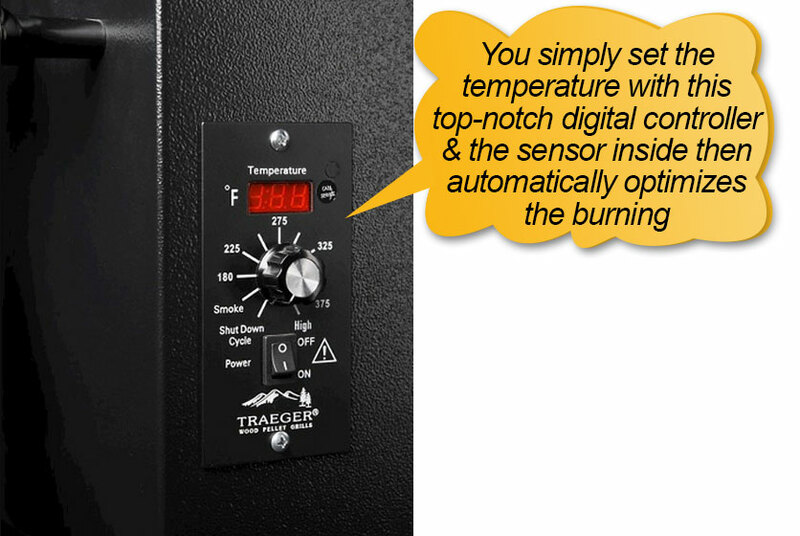 This Traeger BBQ 155.01 Pellet grill review will reveal to you whether you should consider it. 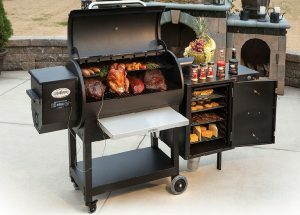 Traeger BBQ155.01 19.5K BTU Pellet Grill gives you a medium sized cooking area of 292 square inches. The small cooking space is sizeable enough to help you cook meat for a small group of people or a family. It can easily hold 12 burgers, 2 chickens, 18 hot dogs and 3 rib racks conveniently. Otherwise, if you’ll be barbecuing for a larger group, then you might want to consider a bigger BBQ. Traeger BBQ 155.01 is designed with side table for convenience when you need to place things on a surface. This grill is among the many grills with a front mounted shelf, but if you like a grill with a front shelving, just go ahead and get it. The grill’s lid has an attractive bronze lid finish which gives it a great brilliance during a sunny day. Its electric auto start ignition gives you the power to start the unit without any hassles. We all know that the temperature regulation is an important part of barbecuing delicious barbecues, this unit comes with a digital temperature control giving you a perfect temperature setting for all types of foods you need to grill. Tailgater is quite portable and you can easily carry it from the truck to the cabin without sweating. It features a full-size unit in a convenient and portable package. You can easily grill, bake, smoke, barbecue and braise wherever and whenever you please. The Tailgater has plenty of advantageous features to make your cooking process much easier. When it comes to smoking, bigger cooking space is always an added advantage. If you are into grilling you’d know how it feels if the amount of smoked meat falls short. Besides, it takes time to complete the second session of cooking. 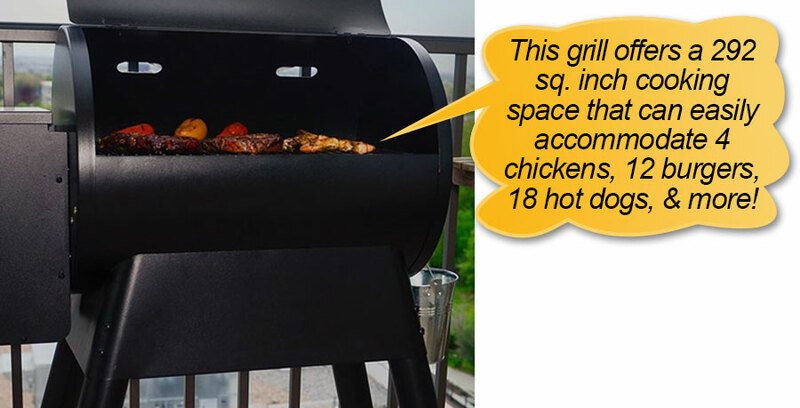 In that case, Traeger offers a huge 292 square inch cooking space in its BBQ155.01 model. With this grill, you would need only one cooking session for a big party. All the grill lovers know that the challenging part of traditional smoking is lighting the fire. The invention of electric ignition has saved the grilled meat lovers from this hazard. 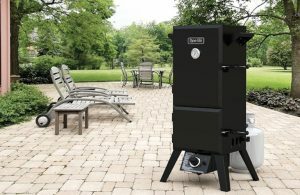 Traeger added the function successfully into this smoker which is a pretty efficient electric ignition system that sets fire to the pellets without outside interference. This smoker sports State of the Art digital controlling technology with three position cooking control that allows you to regulate the temperature inside. You can have full control over what you are smoking. 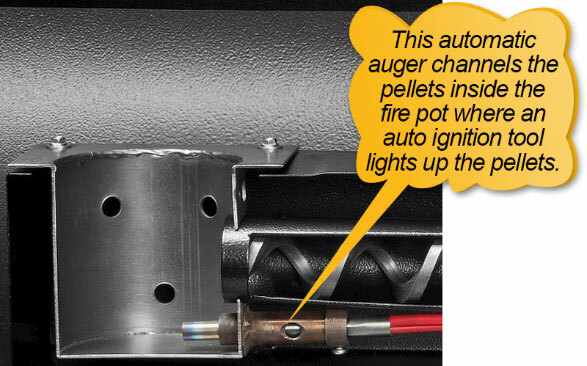 There is a sensor built inside which provides information as to whether the auger needs to carry more pellets to the fire pot or not. The auger in this smoker is fully automatic in the sense that you just need to set the temperature using the digital controller, and this auger would know how fast it needs to spin to carry pellets to the fire pot. For more temperature, more pellets are channeled, thanks to the temperature sensor. When the heat is optimum the auger automatically shuts down channeling pellets. Lid is a very important part of every smoker as it seals the heat while maintaining a sharp difference between the inside and outside temperature. This is why the build quality of the auger must be high. It is also subjected to rust. However, this smoker flaunts a bronze lid which is absolutely rust free and strong. It has an amazing design on it to sooth the mind every time you look at it. 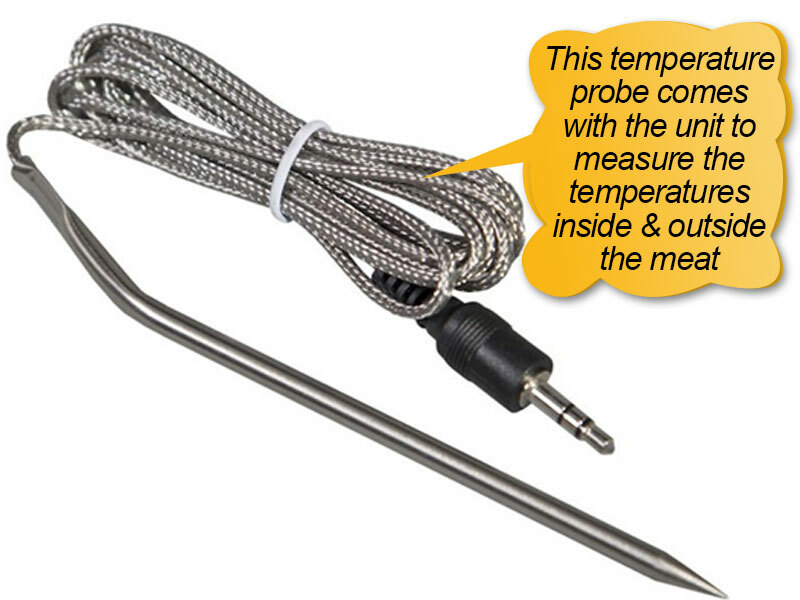 Meat temperature probe is a must for great smoking due to several reasons. You must know the inside temperature of the meat if you don’t want to sear it too much or remove it too early. The combination of heat and timing is the key to great smoking. All you need to do is keep the probe inside the meat and put the other end inside input socket. This smoker is equipped with a large pellet hopper that has enough storage capacity for long time cooking session. However, the hopper size is proportionate to the size of the cooking area of this smoker. 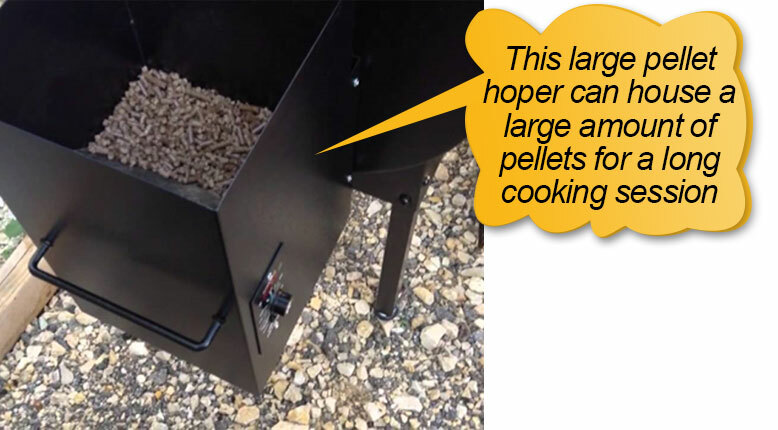 For bigger cooking area you need a larger hopper for storing more pellets, and this smoker has that. Grease and fat are the inevitable output of smoking and one has to clean up this mess or else the entire cooking unit will be in trouble. Thanks to the clever engineering of this smoker the design allows the internal grease and fat drain out into bucket outside. You can easily cleanup without going through a lot. Keeping the grill clean is crucial if you want to get the most out of the unit. Old debris can affect the effectiveness of the unit hence regular cleaning is necessary. Moreover, when moving it around, take caution not to knock it since it comes with small legs which can easily tip over the unit when knocked. Cleaning has been made much easier as all the grease drippings are directed away from the cooking chamber into the collection bucket. Removing the ash does not need to be done after every cooking since the ash collector is sizeable enough to hold ash for several cooking sessions. 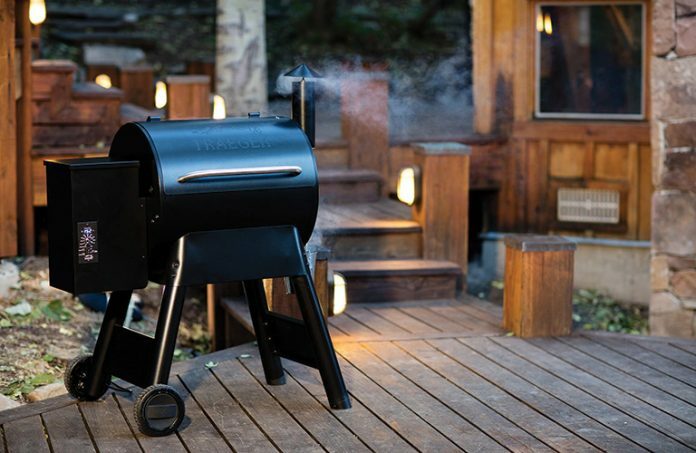 Traeger BBQ 155.01 has plenty of features and pros which makes it among the most preferred BBQs in the market. Energy economy – It is powered by the standard wall outlet, using 300 watts during the first 4 minutes and 50 watts only for the remaining period of time when cooking. Convenient shutdown cycle – the unit features a nice shutdown cycle that keeps induction fan running for 10 minutes so as to lift residual ash from fire pot before shutting down automatically. Hassle free cooking – the fire pot has a hot rod at its bottom which ignites the wood pellets hence keeping the fire burning through so you can relax as your meat cooks. The hopper is sizeable for carrying enough hardwood for hours of grilling and smoking without requiring refilling. Even cooking – the unit has a convection heating process aided by the induction fan which circulates hardwood smoke in the entire cooking chamber to create an even distribution of heat and an epic flavor. Delicious flavor – food cooked on this unit has a delicious flavor as compared to food cooked with a charcoal or gas grill. The unit allows smoke to penetrate the meat giving it a tremendous flavor while the indirect flame keeps the food juicy and tender. 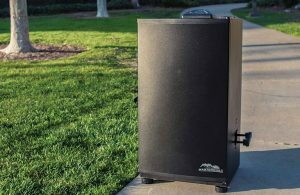 Easy mobility – this is particularly a great feature as it lets you carry it along to a friend’s place for a BBQ session. This is made possible by its wheels and relatively small size and weight. You can load it to your truck and off without breaking sweat. The unit despite having several pros, it also has a few features which can be a con depending on your needs. Small cooking area – Tailgater has a small cooking area which makes it not suitable for large group cooking. High power consumption – the power requirements of the unit are very high during startup. 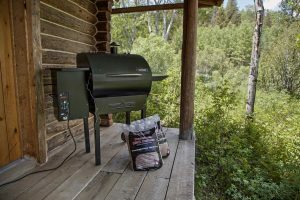 Traeger is quite easy to assemble and use. You simply need to fill the hopper with wood pellets, plug the unit to a wall outlet, switch it on and wait for four minutes for the pellets to become burn with a smoky flame. Once you’ve set your cooking temperature, the unit will maintain the temperature for as long as your cooking lasts. If your cooking lasts longer, then you may have to worry a little about refilling the hopper with pellets. Otherwise it’s quite easy to use and suitable for barbecuing amateurs as well. 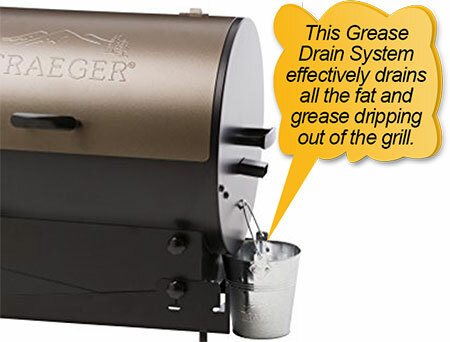 Traeger offers a warranty period of 3 years, but the unit must be free from defects in workmanship and materials. Warranty period starts from the purchase date and goes for 3 years. 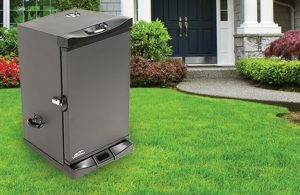 Traeger Pellet Grills BBQ155.01 19.5K BTU offers easier portability and this is what particularly gives you value for money. The unit has all the features as many other pellet grills but its portability is an additional feature which other units lack. So, if you are looking for a BBQ that can be easily loaded into a truck to a friend’s outdoor party, it’s certainly is the ultimate choice. It gives you the real value of your money. Stainless steel fire pot grease bucket. These and many more replacement parts for Traeger Pellet Grill can be found online at this site at relatively affordable prices. This is just one of the sites offering the replacements parts, you can also make purchases from any site at your own convenience. To sum up this review, the unit is good depending on your own needs. Traeger Pellet Grills BBQ155.01 19.5K BTU has a smaller cooking area as compared to other pellet grills in the market. This makes its use restricted to cooking food for small groups of people. Hence if you need a larger cooking space, it’s not a good recommendation. However, if your concern mainly lies on something that can be carried on a truck to an outdoor grilling party or to a friend’s place, it’s certainly a good recommendation. Apart from portability, it also gives you a cooking flexibility as you can grill, bake, smoke, barbecue and braise without any hassles. The grill features a full-size functionalities in a portable package, hence a good choice for anyone looking for portable choice. Question: How much power does the grill use and can it be used along with an inverter? On an average, this grill uses 4 Amperes in the 1st 4 minutes after it is switched on. After that, it comes down to 1.5 Amperes until the cooking process is completed. Yes, this grill can be used with an inverter, specifically with the 400-Watt Pure Sine-Wave inverter. You will need a 1000-watt generator for using this grill. Question: How long does a bag of pallets last, and are these always required while cooking? Hardwood pallets are the main heat source of this grill, so these are always required for using it. The grill uses 1 to 3 pounds of pallets per hour and each standard bag weighs 20 pounds. These pellets can be used to power this grill for 20 hours on smoke and 6 hours for each bag when cooked on the “High” mode. Question: How can the pallet flavors be changed and can 2 or more flavors be mixed? In order to completely change the flavor, scoop out the existing ones using a small container and fill with the new flavor. In case you want to create your own flavor blend then you can do so by mixing the desired hardwood varieties. Question: What is the proper procedure for shutting off the grill? Once you are done with the cooking process, make use of the ‘Shut Down’ setting from the controller and wait for 10 minutes for this cycle to be completed. After 10 minutes, the induction fan will automatically shut off. Once that happens, turn off the power switch. Wonderful exatonalipn of facts available here. Really it is a wonderful smoker grill. Right you are. We test and research a lot before publishing. Its really joyous to motivate someone. Thats really a good news to be aware of. Everything published made a great deal of sense. However, what about this? what if you typed a catchier title? I ain’t suggesting your content is not good., however suppose you added something to possibly get folk’s attention? I mean is a little boring. You should glance at Yahoo’s home page and watch how they create article titles to grab people to click. You might add a video or a picture or two to grab readers interested about what you’ve got to say. Just my opinion, it might bring your posts a little bit more interesting.